Dr. Santana studied human biology and Spanish literature at Cornell University and completed her medical degree from Harvard Medical School. After completing her residency in internal medicine at New York-Presbyterian/Weill Cornell Medical Center, she pursued a master’s of health science degree in the Robert Wood Johnson Clinical Scholars Program at Yale. 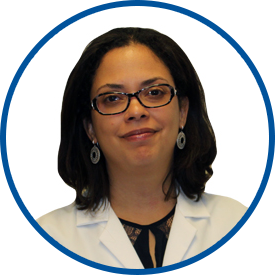 She has practiced as an internist in a diversity of settings including faculty practices at Cornell and Montefiore, and Fair Haven Community Health Center in New Haven. Most recently, she was associate professor of medicine and director of quality in the Department of Medicine at Albert Einstein College of Medicine/Montefiore Medical Center. Dr. Santana specializes in all areas of internal medicine, particularly in the care of chronic conditions such as diabetes, hypertension, tobacco cessation and preventive medicine. She is a member of the Society of General Internal Medicine. Dr. Santana is fluent in English and Spanish. She joined Westmed Medical Group on September 2, 2016.